Mission: The Breachline Database Subgroup is developing the foundation for a single, authoritative, digital dam breachline dataset for Minnesota utilizing standards and methodology through collaboration with breachline subject matter experts. The subgroup has extensive knowledge gained in building their own individual digital dam breachline datasets and cumulatively, these datasets have hundreds of thousands of breachlines. 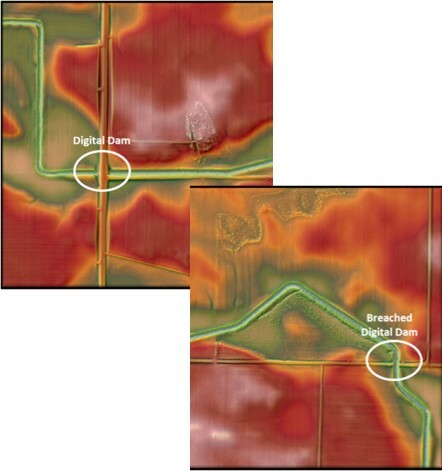 The long term goal is to publish these features into one authoritative dataset for use in developing hydro-modified digital elevation models (hDEMs) that serve public and private business needs associated with hydro-terrain analysis tools (e.g., PTMApp and ACPF), hydrology, and hydraulic modeling of the landscape. Click on a date to view the minutes or agenda for that meeting. Culvert Inventory Application Suite: The DNR Culvert Inventory Application Suite is comprised of 4 related components for the collection, storage, edit/review and distribution of stream crossings, culverts, bridges, and breach line data. It was developed by the MNDNR GeoSpatial Water Resources Team (GeoWRT) in partnership with DNR MNIT professional services staff. This application is available to DNR staff and external partners (free registration required). Hydromodified DEM status map: A story map created by Houston Engineering, Inc. to show the status of DEM hydroconditioning and product development for the PTMApp application (a tool to prioritize, target and measure best management and conservation practices to improve water quality).